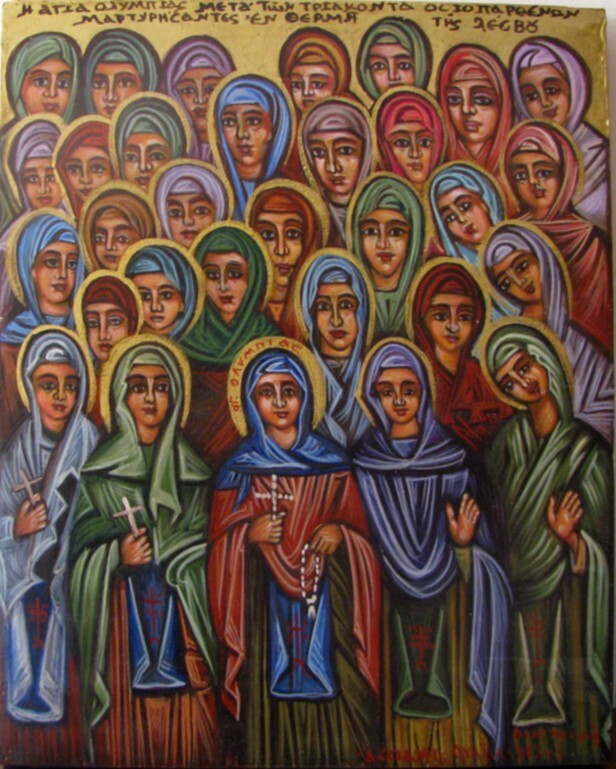 In the thirteenth century, two hundred years before the martyrdom of Saints Raphael, Nicholas and Irene, there was a convent of nuns on the same sacred location where they were to be martyred. It was up the hill from the village of Thermi, about eleven kilometers from the town of Mytilene, which is the capital of the island of the same name. The hill on which the convent stood was called Karyes, which means "walnuts". For many years no one knew why it was called Karyes, for no walnut trees grew there in modern times, but as the local inhabitants were to find out, it indeed once did possess walnut trees, as well as a convent of nuns, although until 1961 there was no visible trace of either. The convent at that time was a large establishment, built in the eighth century probably by Empress Irene (792-802), who was exiled on the island. The imperial origin of the monastery was revealed in a vision in 1961 to Kostas Kanellos from Kydoniai in Mytilene, who saw the saints of Thermi with a military officer. According to Photios Kontoglou (A Great Sign, p. 115): "The officer said he came from Kalloni, where he dwelt in a monastery. The officer explained how an empress built the Karyes Monastery. The officer described it as a large complex with an imperial suite or cell. The officer told Kanellos that there were three icons still remaining: one underneath the church, another at the holm-oak, and the third in the forecourt." Kontoglou believed the military officer was Saint Demetrios of Thessaloniki, since there is a church dedicated to him at Kalloni. In 1235 the convent was attacked, demolished and set on fire by Turkish corsairs out of Crete. Many nuns were slain. The Abbess at the time was named Olympia, who attained great heights of virtue and sanctity. Her mother was from Constantinople and the daughter of a priest, and had three sisters and one brother; the latter eventually became an archimandrite. Her father, the priest, counseled his daughter Dorothea to become a nun, and in time she became the abbess at the Monastery of Karyes. Her three sisters married. Olympia's mother married a man who became a priest in the Peloponnese. It was there that Olympia was born and raised in the piety of the Orthodox faith. When Olympia was ten years old, both of her parents died, and was therefore sent to Karyes in Mytilene to her aunt, the Abbess Dorothea. There she decided to also dedicate her life to the Lord, and at the age of nineteen she was tonsured a nun. When she was twenty-five her aunt Dorothea reposed, and the sisterhood elected Olympia as her successor. She had thirty nuns under her spiritual direction, with eighteen cells at the convent. On the 11th of May, in the year 1235, pirates attacked the convent, and at first tried to defile the nuns. Some escaped and fled into the mountains, but many were raped and slaughtered by the Turks.One of the elderly nuns, Mother Euphrosyne, who was infirm and could not walk and hide herself, was greatly tortured by the attackers. She was suspended on a tree and burned alive. All that remained of her were ashes. Mother Olympia did not wish to flee. She chose to remain behind and endure the horrific torments she was to endure. The pirates took lit torches and burned her flesh. They then prepared a red-hot iron rod and hammered it into her ear forcing it out of the other ear. She was also tortured with candle flames. They then stripped her and stretched her on an iron door, and affixed her there to a wooden board using twenty large nails. The pirates then took three nails larger than the others and hammered them into her head. Two of the nails were driven into each ear. The third nail penetrated through her cranium. After she expired, they burned down the monastery as well as its beautiful church. What was left of the monastery lay in ruins for about a hundred and fifty years, when a pious and wealthy woman named Melpomene undertook to rebuild it, though this time it would be a monastery for men. It was in this monastery where Saints Raphael, Nicholas and Irene were to suffer martyrdom at the hands of wrathful Turks. In September of 1961, Vasiliki Rallis had a dream in which she beheld the young girl Saint Irene, who informed her that Karyes first housed a convent. She told her that that the nuns who had lived there were maltreated by foreigners, and though some fled to the mountains, others were slaughtered. Because of this, no nun dared to live there again, which is why a male monastic establishment was created. Then, in January of 1962, Father Pachomios of Pyrgoi described to Vasiliki Rallis what he had seen in his sleep as a young nun with a cross on her chest entering the church at Troulloti together with little Saint Irene. The nun said to him that she was from Karyes and her name was Olympia the nun. He wondered what a nun was doing in a men's monastery. When he said this, Vasiliki recalled the dream she had seen in September. "It was the 13th of February. I beheld Saint Raphael, who invited me to follow him to Karyes. When we arrived I took note of the lofty walls. We passed through one huge door. I entered the sacred precinct to a monastery that was unknown to me. We entered the Byzantine-style church and offered veneration. When we exited, I heard it said to me: 'Take good heed and see how things are here.' I then counted the monastic cells. There were eighteen in number. Then a strong voice addressed me and said: 'Pay attention well.' I answered: 'I am watching.' The voice then said: 'This place shall be shaken up and down, and others will build.' Then I was taken to the last cell. We went inside. I saw a young woman clad as a nun. Then I was told to go forth and speak to her. After that encounter, Saint Raphael disappeared. I then listened to what the woman was saying. 'My child,' she said, 'my name is Nun Olympia. One day I shall recount to you my entire history.' Then she removed a cross from over her head and passed it on my neck. She then said to me: 'This cross saves; one day it will be found.' On the reverse side of the cross there were letters written that read: 'Olympia, nun.' I then awoke from my dream." That day Zacharias went to gather olives, but he fasted and prayed hoping to be accounted worthy of the history of Mother Olympia, as she had told him in the dream. This was granted to him on the 16th of February, when Mother Olympia related to him the account of her martyrdom. In July of 1962, Kostas Kanellos had a dream i which he saw a nun in a temple laid out on the ground, her eyes closed and her eyes folded on her chest crosswise. When he stooped down to help her up, she opened her eyes and smiled and stood upright. She then indicated to him where he was to dig, to the right of the sanctuary. Thinking that he would find there an icon of the Theotokos he was looking for that had been earlier revealed to him, he started digging there in August with Doukas Tsolakis and Apostolos Vetsos. After digging to a considerable depth, instead of finding an icon, they discovered a very old tomb. The bones were half powder or dissolved. Mingled with the remains were large nails, now corroded with rust. Twenty such nails were discovered with her body, and three larger ones were in her skull, two of which were in her ears. The third one had fallen within the cranium, so that when Kostas went to recover them, he broke the skull in pieces. Most understood that this was Mother Olympia who had been revealed, but others doubted. After two days, Anthoula Alaterou had a dream in which she herself was at Karyes. She entered the chapel where she beheld some nuns chanting the Supplicatory Canon to the Theotokos. She then stood beside a bowl filled with holy water. She then saw the nuns washing the bones and nails recently unearthed. She offered to help, and the nuns accepted. The door of the chapel then opened and a large-boned cleric entered. The nuns stood respectfully before him and calmly said: "Saint Raphael!" He came closer and took up the head which was in little pieces. He then made all the pieces adhere with a tape rendering the relic perfect. He then removed a garland from his cassock and placed it on the head as a crown. This touched Saint Raphael. Anthoula then asked: "O Saint Raphael, to whom do these sanctified bones belong?" He replied: "They are those of Olympia, who was found with the nails." With this, Anthoula awoke. 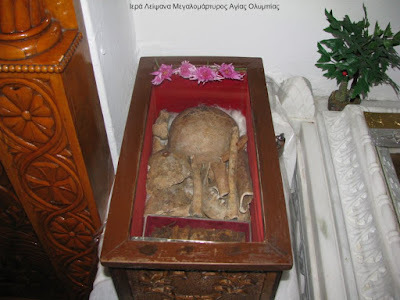 Thus, the bones of Saint Olympia, discovered by the excavators, were washed by Vasiliki Rallis and Maria Dourgouna. The bones were then placed in a chest with the nails. That night Vasiliki beheld Saint Olympia in a dream. She saw her as young, of average height, pale, with a sympathetic countenance. With tears in her eyes, Olympia said: "O if only you knew the slaughter and the martyrdom my eyes beheld, your heart would be rent to pieces!" 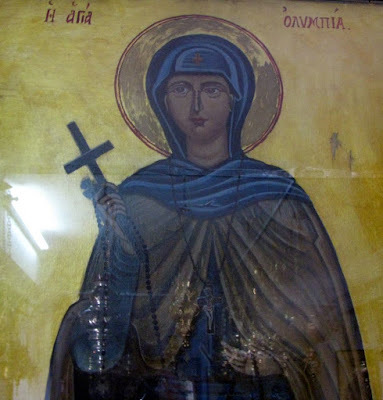 The Panagia also appeared to Myrsine Dourgana in a dream, telling her: "You all should have no doubt that the tomb where the nails were found is that of the Martyr Olympia. Hearken how her martyrdom came about. After the pirates tortured her much, in the end they stripped her naked and stretched her upon a board which was the shutter of the monastery door, over which they affixed her with nails. When the Christians buried her, they did not remove the nails from the board, because they were not able to do so without extracting her flesh which had already mingled with the board. Thus, the nails remained, which is why they were found betwixt and between her bones. Tht is the tomb which you found, so no one should make any further comment to the contrary." Then Myrsine awoke. Zacharias Paphliotes received another dream. The Nun Olympia appeared to him as she had done before, and she told him about her family background, as recounted above. On the 17th of November in 1962, Asemenia Vournovalis had a dream. 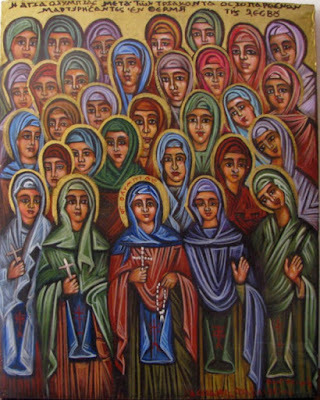 She was in Karyes where she suddenly saw a group of nuns coming from the east. They were walking two by two, as they ascended the monastery. Their leader was a tall-looking nun, who seemed to be giving them orders. As they approached, Asemenia said she counted twelve. The leader was wearing a crosswise ribbon-like band that had the name Olympia. She also noticed the other nuns had similar bands with their names. The only other names she could distinguish were Maria and Euphrosyne. The nuns then stopped at the holy water and sang the national anthem. Asemenia then spoke with Maria, who told her that they endured much, suffering torture, slaughter, hanging and burning. Maria then remarked that they were not dead, but alive. She then pointed to a nun with a parlyzed foot, saying the criminal pirates wrought that injury. Then suddenly Asemenia heard a cry: "I'm burning!" She turned and saw a little girl who was naked, and all over her body were wounds and bruises. Two nuns were then seen going over to her to treat her, but she kept crying, convulsing and shouting: "I'm burning!" This was a heart rendering scene. Asemenia then asked Maria who this girl was, and she answered: "She is the young girl whom the Turks burned inside the cask at the time when they tyrannized Saint Raphael." 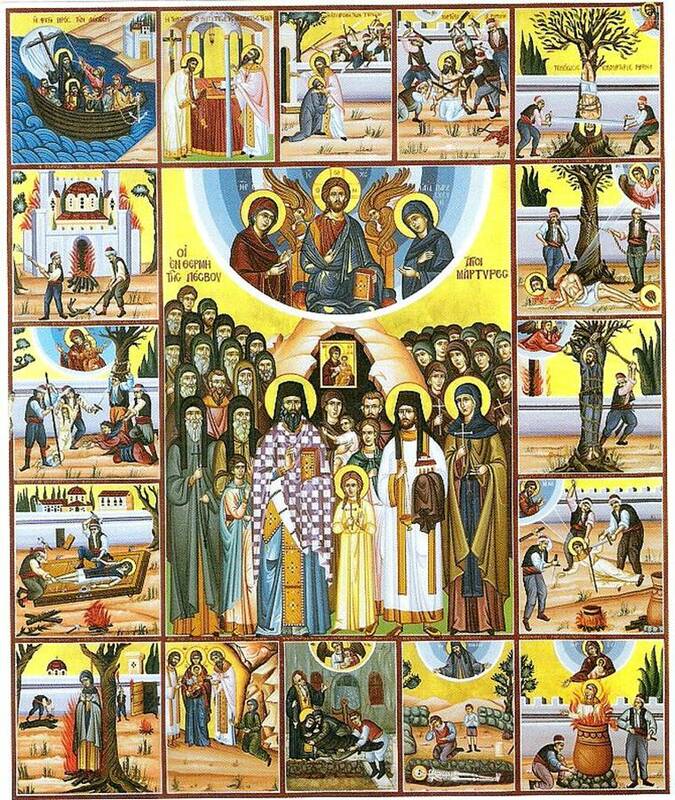 Asemenia therefore beheld how Saint Irene suffered martyrdom. Her emotions made her wake from her sleep. 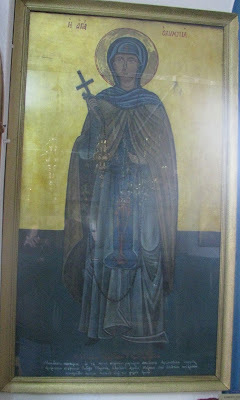 Saints Olympia and Euphrosyne are annually celebrated by the Church on May 11th. The relics of Saint Olympia can be venerated at Thermi in Mytilene at the Monastery of Saints Raphael, Nicholas and Irene, and there is a portion at the Monastery of the Great Cave in Kalavryta. Living venerably in monasticism at Karyes, you contested in this monastery, slain by the hands of the pirates, even now you made known divinely-inspired one, to incline towards the divine, showing Olympia, your entire contest, wherefore Venerable Martyr of Christ we bless you.